The Scottish SPCA is monitoring a pilot whale pod thought to be close to beaching off South Uist. A Scottish SPCA spokesman said the first estimate was that between 60 and 70 whales had been spotted off the coast of South Uist, near Loch Carnan, and a large number appeared to have head injuries. Initial reports suggest around 20 of the whales have severe head injuries. Their injured bodies can be seen from the shoreline as the mammals bob in the water. Scottish SPCA Senior Inspector Calum Watt said: "We were alerted to the possibility of a mass stranding yesterday evening and are now co-ordinating with British Divers Marine Life Rescue (BDMLR). 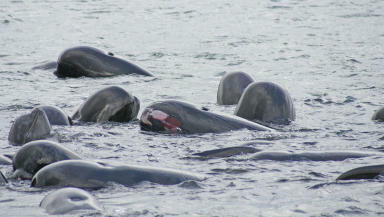 "When pilot whales come inshore there is a very strong chance some among the group are sick or injured. We believe around 20 of these whales have severe head injuries but at this stage we aren't sure of the cause. "One possibility is these injuries were sustained during a previous attempt to strand themselves. Pilot whales have extremely strong social bonds, which sadly means healthy whales within the pod will follow sick and injured whales onto the shore. "At this stage we remain hopeful they will not strand themselves but our concern is the injured whales will come onshore and be followed by the rest of the pod. "Attempting to refloat so many whales would be a huge task and if they do become stranded we'll need to decide upon the best course of action. "The largest number of whales we've tried to refloat before was seven, which was in 1993. Unfortunately all seven returned to the shore and died." Alistair Jack, BDMLR's Scottish co-ordinator, said: "We first became aware of the incident late yesterday and have immediately responded. "We anticipate having trained medics and rescue equipment on the scene by mid morning. This is one of the largest events of this kind ever in the country." The pod is in Loch Carnan, where 35 pilot whales threatened to strand themselves in October last year. The whales did return to sea but were later found dead on the Irish coast.